Spoilage of vinegar by microorganisms is rare, although aceto-tolerant fungi, such as Monil-iella acetoabutens, have occasionally been known to grow in raw vinegar. The more common problem, at least for open vat or trickling type processes, is the occasional contamination with mites and flies. The vinegar eel, in particular, was once quite common, especially in traditional open vat or trickling fermentation systems, but is now infrequently present.The eel is actually a small worm (i.e., a nematode classified as Anguillula aceti) whose main effect is aesthetic rather than influencing the fermentation or product quality. Vinegar eels are readily removed by filtration and easily killed by heat. Given that vinegar fermentations are conducted in the presence of ethanol and acetic acid, one might expect that bacteriophages would not be a serious problem. However, the absence of a heating step for the substrate, the repeated use of the same culture, and the generally open manner in which vinegar fermentations are conducted, certainly provides the right opportunities for phage proliferation. Even submerged fermentations in enclosed stainless steel fermentors do not preclude phage infections, unless pasteurized substrates are used or other phage control measures are applied. Nonetheless, it appears that although phage problems have occasionally been reported, the occurrence is apparently low, and there are only a few published accounts of phage infections in vinegar production facilities (although the incidence of unpublished phage problems may be higher). In general, phages are more commonly associated with trickling generator processes, because those fermentations are usually conducted by a diverse mixture of strains where phages would likely proliferate. In fact, trickling processes are considered to be the main reservoir for Acetobacter phages. However, submerged fermentation systems are likely more sensitive to phage problems, since they often rely on a single strain whose infection could conceivably result in a slow or failed fermentation. Perhaps the most frequent microbial problem associated with vinegar spoilage is caused by oxidation of acetic acid by Acetobacter. As described earlier, these bacteria have the metabolic capacity to oxidize the acetic acid to CO2 and water. However, the genes that encode for citric acid cycle enzymes necessary for acetic acid oxidation are not induced in the presence of ethanol. Moreover, acetic acid oxidation is apparently repressed when the acetic acid concentration is below 6% to 7%.Thus, under the ordinary conditions in which the acetic acid fermentation occurs (i.e., when the ethanol concentration ranges between 2% and 10% and the acetic acid concentration is above 6%), the oxidation pathway is not active. Only under prolonged fermentations, when the ethanol is completely dissipated and when the acetic acid concentration is low, would overoxidation occur. 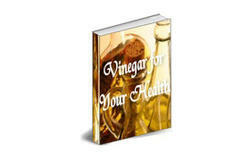 A resource for the many ways you can use Vinegar to improve your health! In today's society of miracle medicine, we often overlook things that have been around hundreds of years! Things like Vinegar!